Robbie MacNiven explores the fate of some of the legendary Highlander veterans of the Battle of Culloden. Dave Sloggett reviews the rocket attacks on Britain during the Second World War, and considers just how effective they were. Stephen Roberts investigates what the British and German fleets learned about modern naval warfare at the Battle of Dogger Bank in 1915. Also in this issue: Behind the Image, Thinkers at War; War Culture; Museum Review; Event Listings; Book of the Month; Competitions; and much more. When did modern war begin? Silly question: it depends on what you mean by ‘modern’. And there is no simple definition, because ‘modern’ is a term you apply to a process of change. Let’s reconfigure. When did the Medieval way of war based on dense agglomerations of warriors give way to a modern one based on lines of professional soldiers drilled to operate like a machine? Henry V fought the Battle of Agincourt with an army of the first type. Marlborough, 300 years later, fought the Battle of Blenheim with an army of the second type. Firepower had, of course, transformed the battlefield in the interval. But tactics had to change in line with new weapons, and it took time for generals to catch up with the drift of technology. The most important tactical innovator is little known: Maurice of Nassau. And the testing-ground of the new tactics? The long Dutch War of Independence from 1566 to 1609. Our special feature this issue is a detailed examination of the reforms and generalship of the greatest soldier of the Dutch Protestant Revolution. Our argument is that Maurice of Nassau was really the founding-father of 300 years of linear infantry tactics. 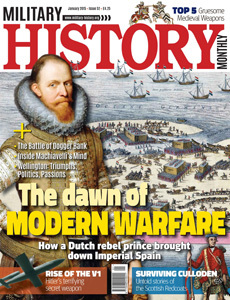 Also in this issue we have Stephen Roberts’ analysis of the clash of battlecruisers at the Battle of Dogger Bank in January 1915, Dave Sloggett’s assessment of the V-1 rocket attacks on Britain in 1944, and Robbie MacNiven’s report on the later military exploits of Jacobite veterans of Culloden.